People, we aren’t always blessed to have encouragers around us – in fact, some of us have the direct opposite! That is why it is so important for us to be in The Word, talking to the Lord throughout the day, praying in the Holy Spirit with moanings and “ugh’s” when necessary, praying without ever stopping! How do we do that? I read somewhere, “NEVER SAY AMEN!” Our lives should be one continuous prayer, never saying amen! I love that. We are anchors of HOPE for others. 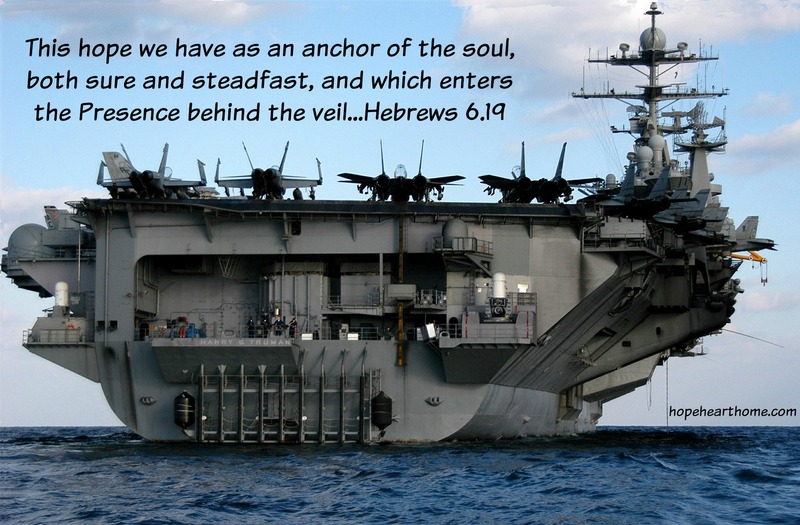 When our problems feel as big as the aircraft carrier in the picture, we need stability, we need a rope, a lifeline, an anchor that shores us up to The One who can change things, to The One who cares, to The One who died so we can live in freedom. My story stretches across the cyber-waves and offers an anchor of HOPE to the woman who just learned her husband is cheating on her; to the woman who found herself loathing her own marriage; to the woman whose children were suffering grief and she didn’t know how to help. I can be a lifeline – a HOPEline. Let’s get real, can we? What keeps you up at night? What are you afraid to talk about? What’s your drug of choice (not necessarily “drugs”)? What mask are you hiding behind? We can help one another. Be an anchor of HOPE. We can help one another. Be an anchor of HOPE. I am a Navy child so the aircraft carrier is something very familiar to me. The first thought I had was how could an anchor steady that HUGE ship and God reminded me immediately that He is the Anchor and can steady everything. Oh, Susan, this is just what I needed to read this day! That little verse in Jude truly does tell me that I am to encourage myself. From that, I can be hope to others for as I follow Christ in obedience, my ways, my presence can be the Christ of all hope to those I come in contact with. I am blessed this day to have had you as a neighbor at Lyli’s for I came here. I believe twice this week we’ve been neighbors! God has a plan!!! Love this! I’m so glad Samantha was so honest with her story. Peeling off our masks….yes! Makes me think of Bethany Boring’s new book. I’m so glad I can be an encourager; a hope line. You are a HOPEline – an anchor of HOPE! Well said Susan. Transparency is so needed and yet…I’m convicted of my own need to remove the things I hide behind. I recently read a quote from Sheila Walsh, to paraphrase it was something along the lines of that when we’re broken we’re a far better bridge to Christ than when we’re not. Love that! So glad I stopped over from #livefree today! Jesus is no respecter of persons but I love His red words, “The sick need the doctor!” Again, a paraphrase! Will visit your corner of the interweb today! Thank you for this wonderful verse from Jude. What an encouragement and affirmation to speak truth and positive things to ourselves. Visiting from Susan B. Mead. Tamera, thank you for stopping by. “Our lives should be one continuous prayer, never saying amen! I love that.” I had never thought of it this way, but it’s true. 🙂 Yes, we do need to be real, to share our stories, to encourage one another with the Hope that only comes from God. Blessings to you, Susan! Gayl, it’s not original but I love it too! Oh, friend, you have hit all the keys words and concepts that have been in my mind all week! It’s the direction God is calling this gal to. I love how He uses you to confirm things for me most of the time! 🙂 You have such a gift! Have you heard of Glennon M. of “mommastary”? Saw her at Women of Faith last weekend and she is ALL about what you are saying!! Awesome things happening here!! 🙂 Keep being an anchor of hope! Diane, THANK YOU for confirming that I’m writing the write (or is that right) thing!! !